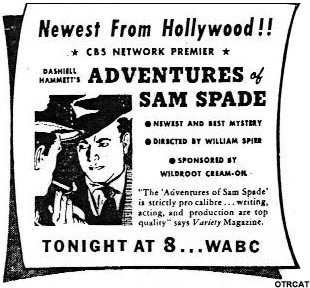 Sam Spade was the creation of Dashiell Hammett, who along with Raymond Chandler godfathered the tough-guy introspective school of detective fiction that got really big after the Second World War. 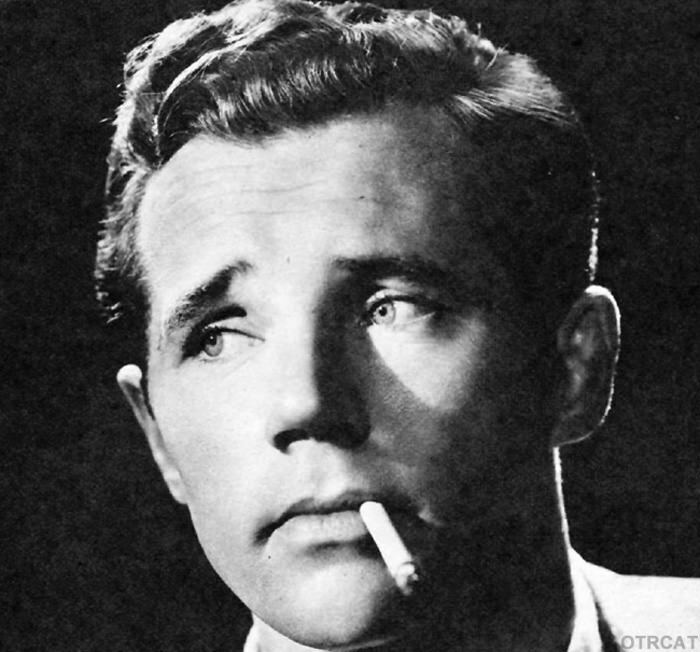 Film star Howard Duff played Sam Spade (also played by Steve Dunne at the very end of the show), Lurene Tuttle was Effie Perrine, his perfect secretary (perfect fantasy of a private eye secretary, that is) and John McIntire was Lt. Dundy. Later William Conrad (Escape, Matt Dillon on Gunsmoke) did Dundy, when the production moved to Hollywood. William Spier, great director of Suspense and many other fine shows, took the tough-guy detective genre and shook it down to basics. Action, drama, toughs, dames, wisecracks and laughs. Add great acting and you have excellent radio. Spade was meticulous enough to make a report on each case as it progressed, in line with Hammett's actual Pinkerton Detective Agency background. As the half -hour show unfolded, these reports were sent to Effie, too, so she always knew the score. It seemed she wanted to score with Sam, but that was a scratch at the track in his book. The caper always came first. The wisecrack came second. And if a tough was unaccommodating, then an uppercut might be in order. Effie was there to take care of the business. 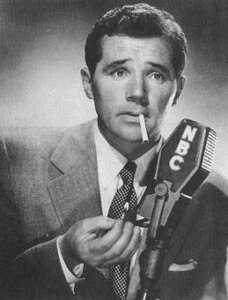 Dunning in his On the Air, the Encyclopedia of Old Time Radio says "The show was loved in its time and still is. The plots were often run-of-the-mill fare, obviously hacked out in the heat of the deadline. No one cared if holes were patched in an obvious and sometimes careless way-this show had a style and class that the others all envied. Duff made the writing part of his own unique character. The wit and charm of the show has weathered four decades, and The Adventures of Sam Spade remains today the pinnacle of radio private "
Included in the update of this show are four episodes of the British Sam Spade - The Maltese Falcon. The Maltese Falcon was the 1930s precursor to the Sam Spade series. But remember, if Sam's busy, then call on Phillip Marlowe, Richard Diamond or you could Let George Do It. And there's even more detective action where that came from including The Saint, Boston Blackie, and The Falcon. See also: Hardboiled Detectives Collection. These recordings are also included in the Dashiell Hammett Collection. The old time shows are brilliant especially Vincent Price and Peter Lore. Reality focused so nicely the imagination goes to wonderful places. Nothing like it anywhere. I can't get enough of Bob Hope, Bing and especially the westerns. Thank you OTRCAT! I am a big fan of Harold Peary- The Great Gildersleeve of course, and also Honest Harold. What a great, and believable, actor. Spade was stylized by Spier as a slight send up of the detective genre and once the team grew into the approach it became a very popular show among those who enjoyed the spoof elements. I love the series,and I’m also a big fan of Marlowe & Diamond (and the latter was quite campy in its own right). Great to listen to classic radio programs with great stories and actors. I Have purchased several of the OTR CDs and love every one of them. It's great listening to some of these old serials, mysteries, and variety programs. OTR used to be one of my favorite pasttimes when I was a pre-teen and well into my 'teens. Multi-tasking was very much I did while listening; accomplishing many different tasks (like homework, reading, doing chores, etc) while listening to Jack Webb, Joel McCrea, James Stewart et al and enjoying great stories of the old west and contemporary Los Angeles crime dramas. I've been an OTR collector for many years in my very post teen years thru my current Octogenarian years. I still enjoy listening to the tapes/CD's I own even tho' they're well worn. I still collect new CD's from your club; old habits die hard! I purchased the Burns & Allen, Eddie Cantor, Milton Berle, Mel Blanc, Groucho Marx, The Goldbergs and Bell Telephone hour collections and enjoy what I've heard so far (it will take a while to hear those discs plus the 14 CD volume Old Time Collection). Great shoes that happened before I was born. Highly recommend them. I've purchased several CDs from OTRCAT. I like listening to OTR when I'm in my wood shop to protect my hearing. i am an avid otr listener, and back when dinosaurs ruled the earth, i even mentioned OTR in my column in Popular Communications Magazine. wonderful recordings and wonderful values! My husband travels a lot for his job so he listens to audio tapes a lot. His favorite is Johnny Dollar but I have ordered several times from you and he has never been disappointed. OTR was very good to deal with...my thing was Sherlock Holmes which I easily put on my iPod nano and later my iPod touch (some 98 in all from OTR)...all of the episodes come in clear as a bell and I listen at bedtime...there’s are the best. At 81 I now use old time radio to drive me to sleep. The reason is that I don't hear very well and have already worn the cassettes threadbare from years prior. My favorites are from the 'I love A Mystery' series with the characters Jack Packard, Doc Long and Reggie York. These guys bring back the forgotten, blurry, 15 minute radio series' at the end of the forties and early fifties to me and I can quote them chapter and verse by memory. But I haven't located 'Stairway to the Sun', 'The Decapitation of Jefferson Monk' and others. Just hearing their theme song 'Valse Trieste' makes me homesick for the radio adventures of childhood. Great people to do business with! Excellent value and technology made available for our listening pleasure. On a variety of easy to use formats! Keep up the great service and best wishes for continued success! I bought your Bob Hope entire series....but can't figure how to play it.